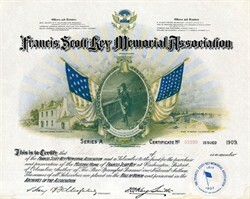 Beautiful certificate from the Francis Scott Key Memorial Association issued in 1909. This historic document has a vignette of Francis Scott Key between two american flags and the Old Key Home in Washington, D.C. and Fort McHenry in Baltimore, MD in the background. This item has the printed signatures of the Association's President( Honorable Henry R. F. MacFarland ) and Secretary ( F.S. Key Smith ) and is over 106 years old. Light water marks on edges. Overall Fine condition. Francis Scott Key's House was built in 1803. the house was located at 3516-18 M Street, NW. Key was residing at this house in 1814 when he headed to Baltimore to secure the release of Dr. William Beanes, a prisoner of the British. Taken prisoner himself, Key watched the Battle of Baltimore from the Chesapeake Bay. When the smoke cleared, Key was inspired to write the poem that would one day become the United States of America�s national anthem. The Key family vacated the house in the 1830s due to the turbulence of the then operating C&O Canal. Time passed, and the house fell into disrepair. Admiral George Dewey, hero of the Civil and Spanish-American War, led the first effort to preserve the Key House in the early 1900s. The Francis Scott Key Memorial Association was a commercial operation dedicated to preserving the house. Revenue was generated through house tours and general donations. Certificates were granted to those making donations. Demonstrating the popularity of the song in American culture, it�s worth noting that preservation efforts began prior to when the �Star Spangled Banner� was made the national anthem in 1931. The Francis Scott Key Memorial Bridge was constructed by the U.S. Army Corps of engineers between 1917 and 1923. The government purchased the Key home in 1930. Little effort was made to restore it. Traffic congestion in Georgetown in the 1940s brought a push for the demolition of the Key House in order to make room for a clover entryway onto the Bridge. Though the Historical Society of Washington, DC fought hard to preserve the building, the home eventually fell victim to the ever-increasing freeways of the 1950s. Once dismantled, Congress passed a bill that would finance the reassembly of the house and give it to The Historical Society. However, this bill was vetoed by President Harry Truman for budgetary reasons. And so the house disappeared during roadway construction and was last seen in 1947. Sources: The Historical Society of Washington, DC, �About Us,� 2008 and The Ten Miles Square, Blog.